It's the time to disco! Join us for the return of Bombay Funkadelic's popular Disco Deewane party. 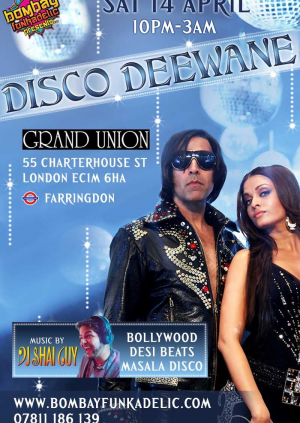 A night of pure Bollywood and Disco joy mixed with some unadulterated Desi Beats. Expect retro vibes blended with modern dancefloor anthems. London’s finest DJ Shai Guy spinning the best in Bollywood, Desi Beats and Masala Disco from 10pm till late. Situated in the heart of the bustling Smithfield market district, Grand Union Farringdon is one of London's pre-eminent late night destinations. A colourful, quirky bar that holds a big personality. Large 280 capacity venue with ground floor bar and basement club / bar. With some seriously grand décor as you enter, patterned wallpaper, mirrors, lampshades and antique-looking cupboards all combine to create a sharp vintage look and a good ambience. PHOTO ID ESSENTIAL (Driving Licence/Passport). Original ID required. No scans/copies.